Hello and good morning!! September has STAMPtember but December has DieCember!! Simon Says Stamp is kicking off an exciting month with a brand new DieCember release! Here’s a quick look at all the fabulous new products! I’ve got lots to share this month but I’m starting off with a video and a second card using two of my favorite products from this release: the Big Picture Book Otter and the Deco Heart! You can watch the video below or at my YouTube channel here. To start I die-cut the soft navy cardstock using the Tickle Breeze die from a past SSS release! I die-cut it three times to resemble bubbles in a ocean background. Then I die-cut the Big Picture Book Otter using oatmeal cardstock from WPlus9, black, and kraft cardstock from Simon Says Stamp. I blended the edges of the otter using tea dye, gathered twigs, ground espresso, and worn lipstick distress oxide inks. Then I adhered soft navy background over a piece of silver glitter paper. I adhered the otter using foam mounting tape and tucked a die-cut silver glitter Rina snowflake into his paws. Next I stamped the sentiment from Punny Animals onto cotton candy cardstock with versafine and heat-embossed it with clear embossing powder. I die-cut it to a thin label using the Sentiment Label dies. Finally, I added a few accents with a white gel pen, spectrum noir clear sparkle, and nuvo crystal glaze. My second card uses the gorgeous Deco Heart along with an older stamp that coordinates with it perfectly! 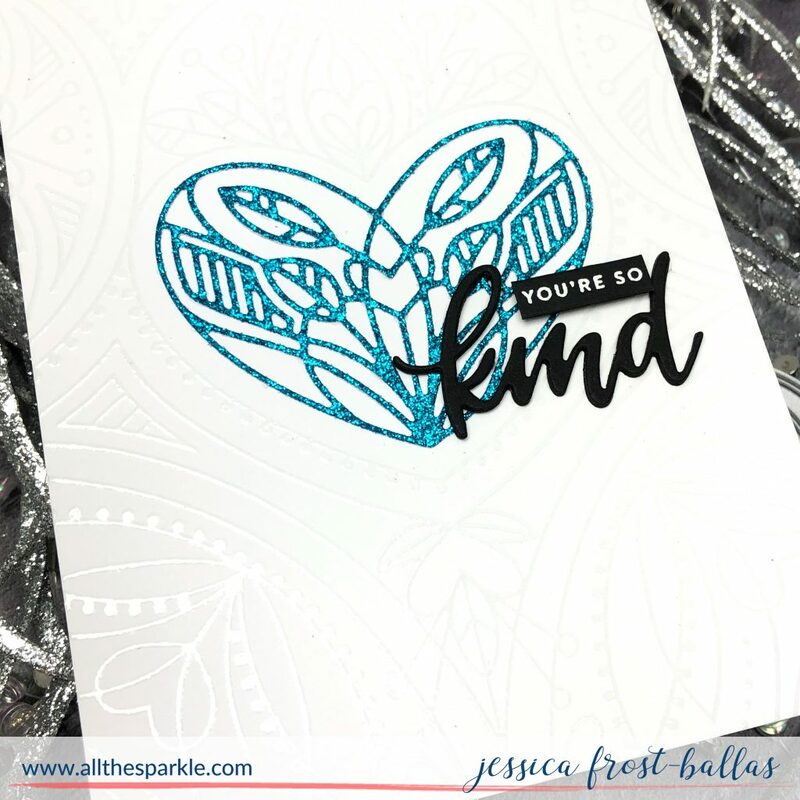 I started by stamping the Center Cut Heart background stamp onto white cardstock (with the center removed) with versamark and heat-embossed it with clear embossing powder for a tone on tone look. Then I die-cut the Deco Heart with blue glitter paper. I used liquid adhesive to adhere it to the center of the panel and it fits perfectly! Then I die-cut the older Kind die with black cardstock three times and adhered them together to form a thicker sentiment. I stamped part of the sentiment from a Tiny Words stamp onto black cardstock with versamark and heat-embossed it with white embossing powder. I used the Sentiment Label dies to die-cut it down to a thin label and then adhered it to the card with foam mounting tape. I used liquid adhesive to adhere the word die and that was it! Super quick to put together and you could use a variety of sentiments or word dies to change up the occasion! 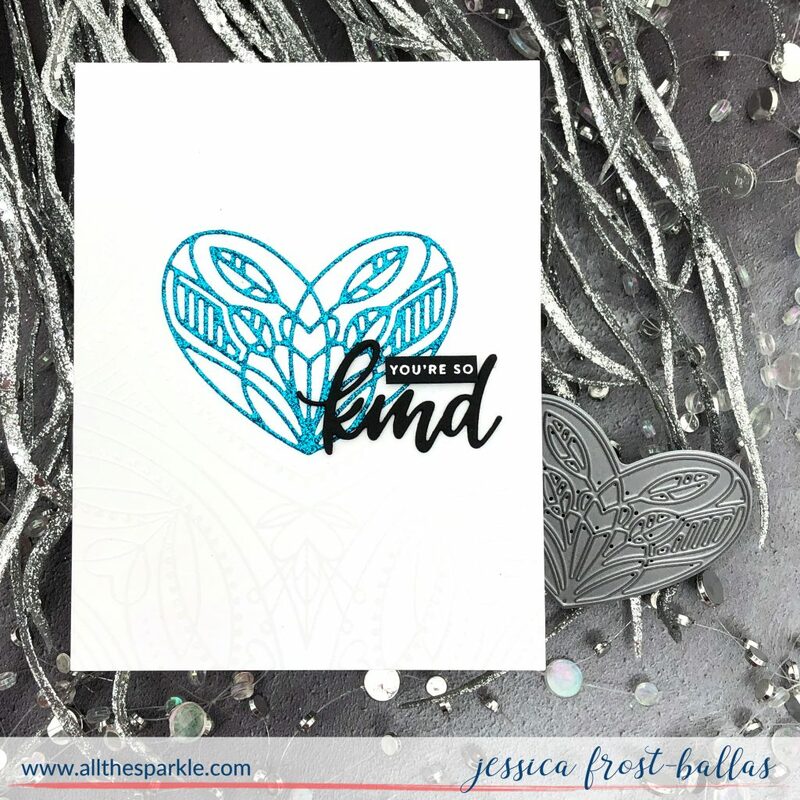 I just love how that Deco Heart fits in the center of the background stamp! I’d love to know what your favorite items are from the DieCember release! Leave a comment before 11:59PM EST Wednesday, December 5th, 2018 and I’ll choose a winner and send them their favorite item! If you are chosen I will send you an email so please make sure you include your email address in your comment! Thanks and good luck! 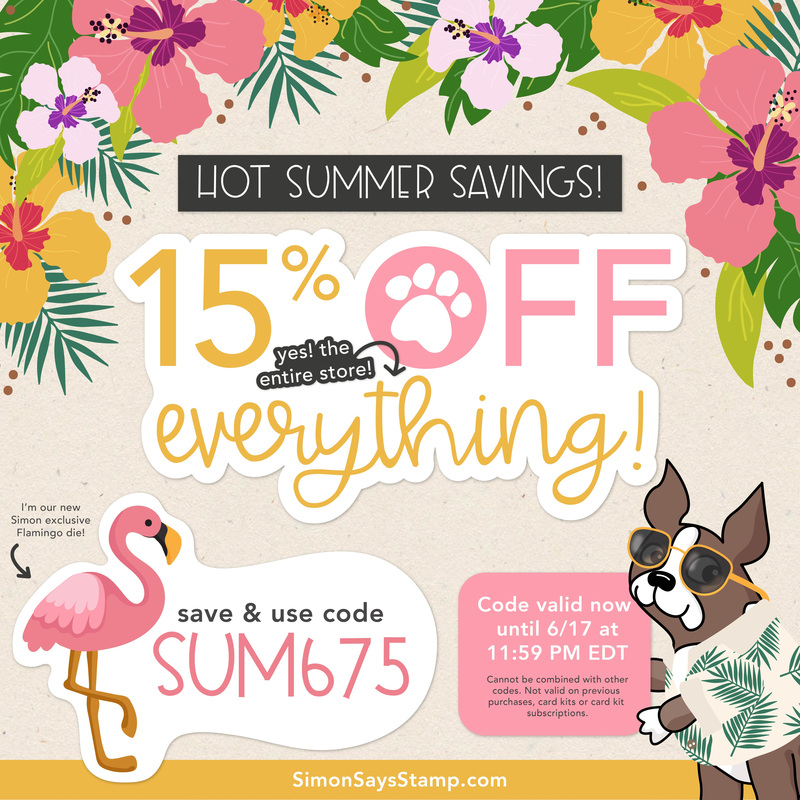 Happy Thanksgiving and an amazing Simon Says Stamp Sale! Beautiful and fun cards Jessica! So many amazing die designs! I think the Holiday Knit Background die is my favorite. So very beautiful. I really like the the Holiday Knit and the Holiday Knit border. I am so in love with pointsetta flowers. They can be done in so many colors and sparkles! Some of my faves are Holiday Knit, Ice Skating Girl, Tree Frame and Holiday Candy Cane. It’s really hard to choose only one! I’m really loving the picture book dies, they are just so adorable and great for cards for kids. I think the Santa pup is adorable. I’ve gotta have the Deco Heart Die. I already own the stamp that it goes with. Beautiful! Love all of this kit!!! I love both the cards you made for this release. So many fun dies to choose from. The second I saw the deco heart I knew I wanted it! I use the coordinating stamp all the time. I love the Bixby background wafer die, but all of the dies are so beautiful! Loved the video today, Jessica! a sucker for animals and these are so cute. I love that bear! How darling!!! My favorite die in the release has got to be the Outline Floral Frame…that thing is gorgeous! Thanks for your generosity! That little otter is adorable! 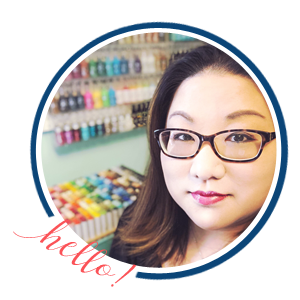 My favorite is the set of Nested Banner Dies, they’re something I could use all year long. Fabulous cards! Love that cute otter and the beautiful heart! My favorite item from the release is the Bixby Wreath Wafer Die! Hi, Jessica. I love your otter card. The otter die is my favorite . I love animals and otters are just the cutest. Super cute card. I love how the ink blending made the little otter come to life. Cute and pretty cards. Love the shading on the otter and the glittery bubble background. My fave is the big Picture Book Bunny. There are so many really good dies I love from this release! My favorites are the Big Pucture Book Kitty and the beautiful decorative Hamsa! So pretty, and I love the details! Thanks for sharing your inspiration today! I 💕 the wrought iron border and the background wafer dies. The otter is super cute!